Dear friends: A quote from comedy writer and journalist Danny Baker to get us started. The eyes of California and the rest of the nation are on THE GOOD PEOPLE OF WISCONSIN today. 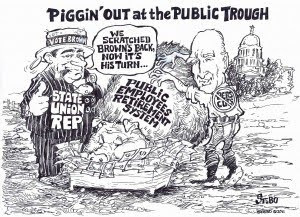 The arrogant, over-entitled public employee union elites are descending on the state capitol, after staging wild-cat strikes and dragging their students along for an afternoon of indoctrination. Their main targets seem to be the new Governor and key legislators, who are trying to enact the will of the people per the vote in November. Keeping it Wisconsin today: I’m really getting CHEESED OFF! Instapundit is following the situation closely, and provides a link to a poll today so that you can vote AYE or NAY to Governor Scott Walker’s budget reforms– which I urge you take to send a strong message to the union elites. I think Californians and other American citizens could benefit by contacting Wisconsin's representatives today to lend support, praise, and incentive to continue on the path of sensible fiscal reforms. Even if we don't live there, our own representatives my pause at offering continued tax-hikes and union-appeasement as standard fare when considering budget matters. WISCONSIN STATE SENATE, EMAIL DIRECTORY. Wisconsin, the eyes of the nation are on you! Related Discusson: Memeorandum, here, here. So the "teachers" are hauling kids out of school to involve them in political activity without parental approval? What happens if a parent needs to reach a kid who's not in school as the parent thinks the kid is? LCR: Thanks so much for sharing this. Truly, Wisconsin is the first battle of the AMERICAN CIVICS WAR. We Badgers elected Walker, turned the Assembly and Senate Repubican for this very thing... and more. The debate and vote in the Senate is being held up since ALL the Democrats went into hiding. The body needs 20 to have a quorum and there are only 19 Republicans. Walker will not back down. As a teacher I would never turn my back on my students. Never. It's shameful for what they are doing. People ought to be losing their jobs and teaching licenses in WI right now.